Adolescence is hard on all kids, but Kate was crippled by disease, bedridden by 13 surgeries. Strengthened by a titanium spine, she shattered doubts and stood on stage! Growing up, I was perfectly happy and healthy; I laughed and smiled just as much as any other child. Little did I know, my life would drastically change before I even reached my pre-teen years. When I was nine years old, my doctor noticed several darker colored "spots" on my skin. After a few tests, I was diagnosed with a disease known as Neurofibromatosis Type 1**. From that moment, my life changed forever. Doctors discovered three tumors along my spine, pushing my spine into a severe curve of 45 degrees. Due to such a dangerous curve, doctors did not believe I would survive unless I had surgery almost immediately. A few months later, I had my first surgery. Two titanium rods (also known as Harrington Rods) were placed alongside my spine. They fused together the three main vertebrae that caused the curve (T12-L1-L2). Since I was going through a growth spurt, I had another surgery to lengthen the rods which each growth period. 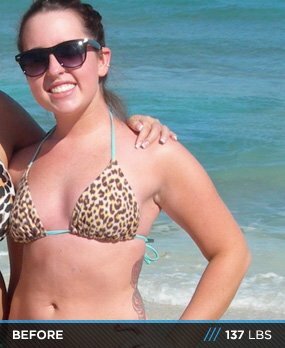 I had a "lengthening" surgery every six months in the span of five and a half years. When I reached the age of fifteen they did a last and final fusion, totaling to thirteen surgeries. During the final fusion, my ribs were broken and re-aligned to coincide with my newly constructed spine. The rods are still on either side of my spine and go almost the entire length of my spine. My childhood was mostly spent in the hospital, on the couch at home, or in physical therapy. My doctor told me although I was lucky to be alive, I would never live a very active life. I refused to believe this and live my life on the side lines. ** The exact definition (taken from https://ghr.nlm.nih.gov/condition/neurofibromatosis-type-1) Neurofibromatosis type 1 is a condition characterized by changes in skin coloring (pigmentation) and the growth of tumors along nerves in the skin, brain, and other parts of the body. The signs and symptoms of this condition vary widely among affected people. Most adults with neurofibromatosis type 1 develop neurofibromas, which are noncancerous (benign) tumors that are usually located on or just under the skin. These tumors may also occur in nerves near the spinal cord or along nerves elsewhere in the body. Some people with neurofibromatosis type 1 develop cancerous tumors that grow along nerves. These tumors, which usually develop in adolescence or adulthood, are called malignant peripheral nerve sheath tumors. People with neurofibromatosis type 1 also have an increased risk of developing other cancers, including brain tumors and cancer of blood-forming tissue (leukemia). When I was eighteen years old I started working at a gym and began working out, but it wasn't until I found the sport of bodybuilding that my body changed and transformed like I never imagined possible. I started looking up videos and reading books on anything I could find related to fitness and bodybuilding. I kept up to date on my favorite bodybuilders and loved watching their progress and success skyrocket. I thought to myself, "Why not me?" I wanted to get up there and show everyone all of my hard work and that I would not let Neurofibromatosis take over my decisions in life. Kate needed her spine augmented with titanium. Her heart has needed no such assistance. 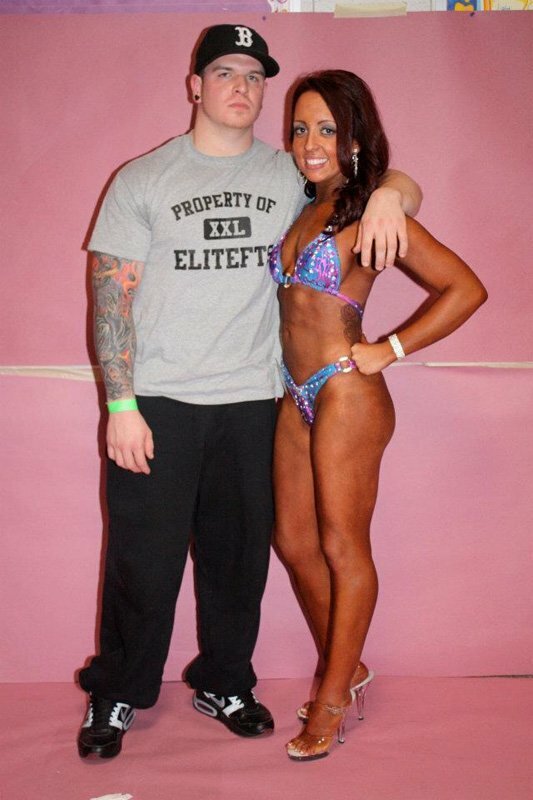 I picked a figure competition date, changed my workouts, and completely revamped my nutrition. 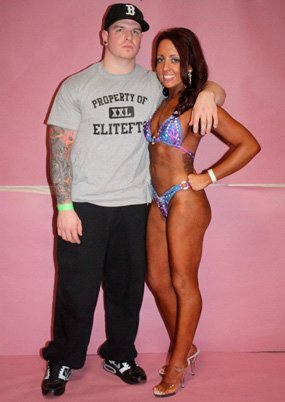 In just 13 short weeks I lost 30lbs and placed 9th out of 14 girls in the Novice Figure Short. 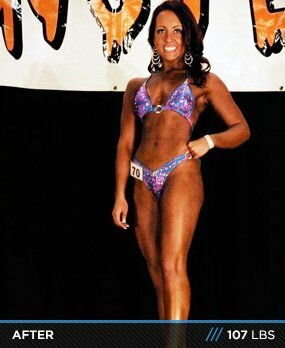 I am currently training for my next show on June 2, 2012. My ultimate goals are to someday win my Pro card and spread the word of health and fitness all over the world, especially to other children who have been diagnosed with NF and scoliosis. There have been many obstacles in my way, but I refuse to be outworked. Nothing will stop be from reaching the top. I want to show other that you can succeed in anything with hard work and determination. When it comes to my meals, I like to keep it simple. If there is something that I want I will have it, but in moderation. When I am dieting for a show, I don't allow myself to have cheats. If you want something bad enough, you will make it an important part of your lifestyle. There will be obstacles throughout your life, it's all about how you take and overcome them. I want to thank Jesse Dimick and the team at SPTA for their amazing help in keeping my back in tip top shape, my family for their constant support, and Al Pirela for his incredible help in which has shaped me to be the competitor I am today. To my best friend, gym partner, and boyfriend, Justin Randall, thank you for always pushing me to better, hit another set, and giving me the courage to continue through the tough days. I look forward to continue on sharing the stage with you. I couldn't not thank my trainer and closest friend, Brendan Haynes (Star Performance Training Systems) enough. He has helped me through the ups and downs and never let me down. His knowledge and passion is not only impressive but has motivated and pushed me to be better each day. I can't wait to make it to the top with him by my side.